The female Bald Eagle nesting in Ridgefield Park is named Alice in honor of Alice Leurck, who photographed the eagle and her transmitter three years ago, and again last week (see photo above). Thanks to Alice's original photo of Alice, we were able to trace her (Alice's the Eagle's) leg bands back to New York State. A link to the post on the bands, including Alice's original photo of Alice, is here. NJMC naturalist Mike Newhouse called to report an American White Pelican at the Kearny Marsh. He saw it from the Keegan Landfill — hard to see from the Gunnell Oval at present — but Deedee Burnside and others reported seeing it from there yesterday. Sorry — didn't mean to scare you. 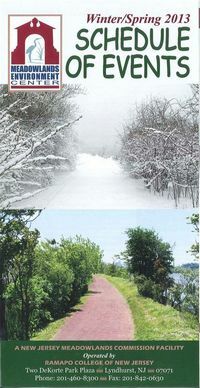 For an idea of what you might see in February, we thought we'd present some highlights from February 2012. For highlights from Feb. 2011, click here. For highlights from Feb. 2010, click here (and think "Shrike"). 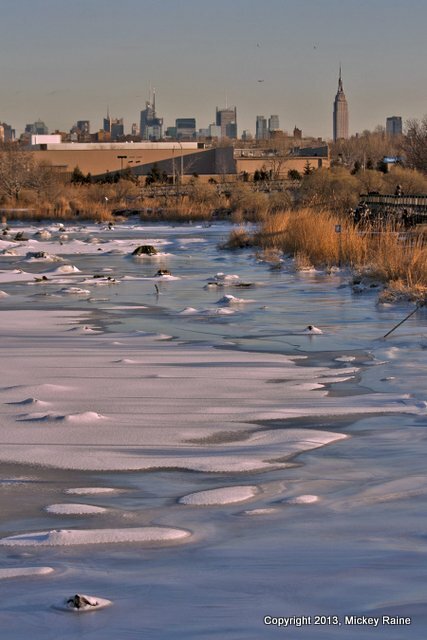 The folks at DeKorte Park's Meadowlands Environment Center have a nifty array of late winter and spring programs on tap — everything from astronomy talks to bee demonstrations and up-close looks at hedgehogs and other live animals. 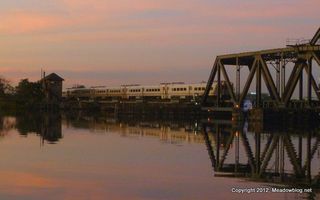 The brochure also lists the free upcoming walks through June that are sponsored by the Bergen County Audubon Society and the Meadowlands Commission. 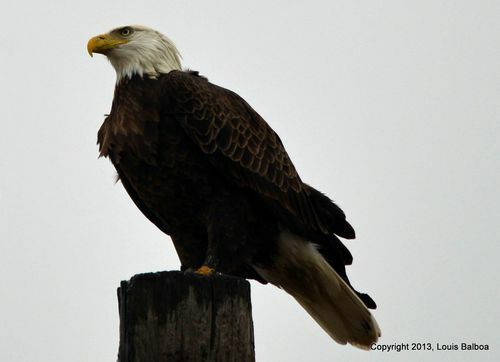 (Updated) Disposal Road Bald Eagle Is From Connecticut! 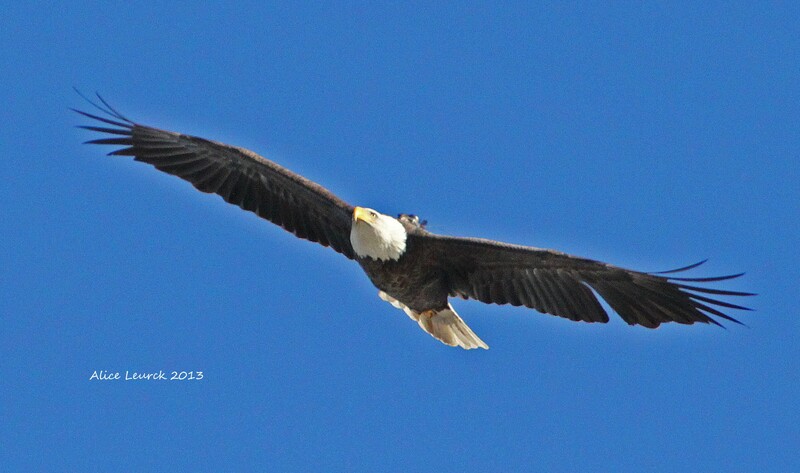 Remember the Bald Eagle that Mary Kostus and a few others saw on Disposal Road earlier this month? Louis Balboa managed to get a great shot of the bird perched on a pole, and as far as we can tell, the black-on-black leg bands read 9 on top and V on the bottom. We submitted the info to the USGS Bird Banding Lab, and they have reported back. 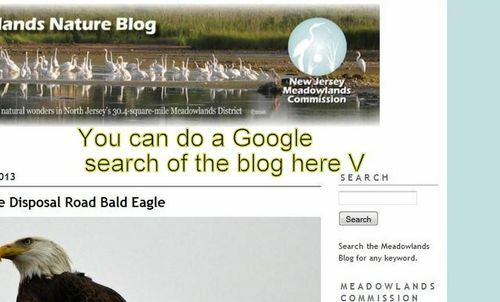 The bird was banded as an eaglet on May 13, 2008, in Burlington, Conn., by the Connecticut DEP's Wildlife Division. "We always like to hear how our birds are doing once they grow up. 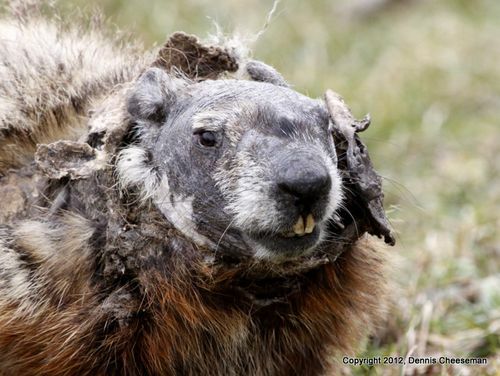 9/V was actually banded by my colleague Julie Victoria, a wildlife biologist who retired in 2011. USGS Bird Banding website is here. 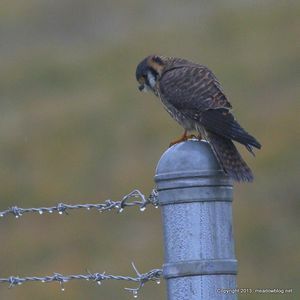 A minute after we photographed the Bald Eagle on Disposal Road earlier this month, we photographed an American Kestrel 50 yards away. Anything unusual about this? 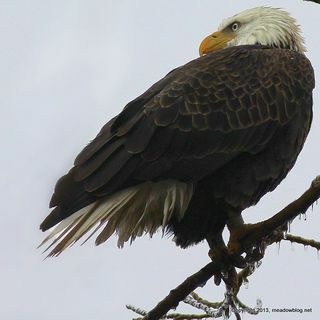 The answer is that the Bald Eagle is the largest diurnal raptor in the eastern part of the United States, and the American Kestrel the smallest. Went with Don Torino of the BCAS to Losen Slote around lunchtime today, looking for the Crossbills. 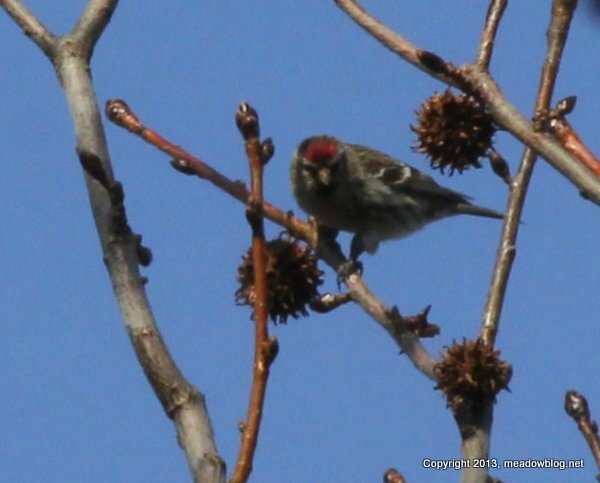 Although we didn't find any, we did see a flock of roughly 100 Common Redpolls (one is at left) way at the top of the Sweetgum trees back toward the meadow. Later, we saw a Red-shouldered Hawk (above) fly in as well. 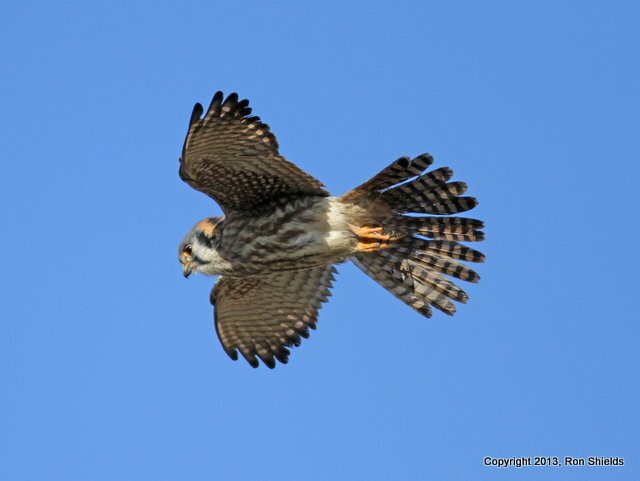 "We had another fine weekend on Disposal Road, with Saturday being much more active than Sunday due largely to the aerial antics of the resident female American Kestrel (above). "In addition, the usual Red-tails continued their cooperation and an adult Bald Eagle provided a distant flyover each day. A Gray Ghost, female harriers and a Peregrine Falcon made brief appearances as well. "No sign of a Rough-legged Hawk but the pipits were back again." 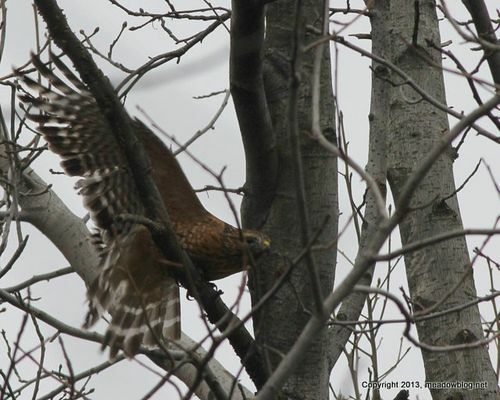 Two more pix — of the kestrel and a (comin' right at ya) Red-tail — follow.